If you’re planning on toning your muscles or improving your core, then an ab machine is a must. It’s a device that gives you positional versatility. You won’t normally get this by yourself. Doing solo sit-ups, push-ups, and crunches are good. But having an ab machine makes your life easier while being more efficient. Let’s take a closer look at some of these machines, and what makes them tick. Buying the best ab machine can accelerate your performance in your workouts. If you manage to find the right tool, it will help you target muscles more effectively with minor discomfort. An ab machine that clearly caters to your body will not only tone it better, but it will also keep you safer and secure. In this section, we will focus on three key areas that are considered to be the most valuable assets that your ab machine should boast. It is important to find these because it will give you a clear idea of what to avoid and what to look for. Foremost, the reason why we went with durability and comfort are that these two factors go together with safety. If you have an ab machine that’s weak in structure, chances are you might get an accident. Plenty of minor injuries happens due to unstable ab machines. If you stumble upon a device that can’t even stay put, then you should reconsider it. Having comfort also increases your safety. At the same time, it doesn’t irritate you. Remember, irritation and discomfort can fail your entire workout. An ab machine’s work is to help you tone your abdominal section. Hence, if it tones your arms or legs instead, then you just invested in a confused machine. You should remember that ab machines should use simple mechanisms. This is because easier movements give your body a consistency for you to remember. A good ab machine must be extremely efficient at what it does. Here’s a video on how to use an ab machine to bring out its best performance. The Stamina Hyper Bench was built and designed to target your core muscles. Specifically, it allows you to build your back and body. As a result, it not only makes your core stronger, but it prevents injury from off-balanced movement. You’re in good control of what you’ll make out of this product. You can use it with dumbbells or without. Thus, you can use it for intense workouts or lighter crunches. Regarding effectiveness, the Stamina Hyper Bench is easy to adjust and comfortable to use. You can shift the angle of the machine to fit the intensity of workout you want. Furthermore, you’ll also be attacking different body parts by doing so. One of the features of the Hyper Bench is the thigh support. You can adjust it to fit your leg comfortably. Also, the foam rollers safely secure your ankles to avoid accidents. Here’s a video on the features and use of Stamina Hyper Bench. Bench comes with thick pads. Very easy to store because of its foldable design. Has an easy-to-reach extended hand grip. Frame is not cleanly built. Can have rough edges and some joints may not be welded properly. The handles are prone to breakage. The base is not stable. The Body-Solid GCAB360 is dual purpose when it comes to workouts. These are exercising your abdomen and your back.The design of this product is based on single station machines in different health and fitness clubs. The Body-Solid’s frame is built from a sturdy 2” x 4” commercial grade steel. This gives you long-lasting durability and safety. Perhaps the best feature of this ab machine is the innovative plate-load design that has a 1-inch diameter post. Perfect for all body types. High-quality steel gives it a stable and sturdy base. Comes with 26 adjustments for position versatility. Plate-load design gives the technology uniqueness and credibility. Design is very close to the ones you see in fitness and health clubs. At the same time, it’s convenient to store and is easy when you move it. Simple mechanisms but provide high effectiveness for your back and stomach. It only comes with a few pictures and a diagram. This could give you a harder time in assembling the product. There’s no sufficient documentation on how to properly use the machine. You must first search online for what are the best exercises for this ab machine. This is to avoid getting hurt as you might do an exercise that is not suitable for the design. 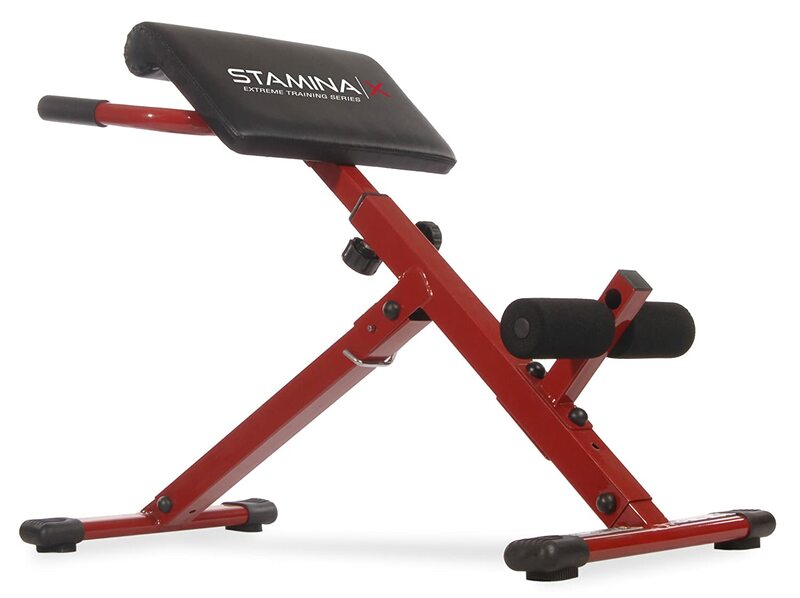 The Stamina Pro Ab/Hyper Bench is a heavy-duty machine that’s built out of 2” graded steel. It has a sleek design that mostly comes from its significant components. For example, the bench is thickly padded, and it comes with a stitched vinyl upholstery. You’ll also get four adjustable positions out of this product that are perfect for crunch exercises. You can also attack your lower back muscles by using the hyperextension feature of this machine. Speaking of hyperextension, the Stamina Pro also comes with a thigh support. Your experience is further enhanced by the safe and comfortable grip of the foam rollers. Check this video to see the Stamina Pro Ab/Hyper Bench in action. Non-slip frame caps protect the flooring but most importantly stabilize your machine. Ideal for crunch workout thanks to its four adjustable positions that can reach 30 degrees. Coating makes this ab machine scratch resistant. Built out of 2” graded steel for long-term durability. The bench is held by a flimsy metal locking pin. It’s quite unstable and can pop out during a workout. This could lead to injury, so it’s best to check the condition. Replacing with a bolt and nut is also a good option. Diagrams for instructions are not clear enough. The manual for assembling this machine is too compressed. Consequently, information lacks and you might have a hard time joining it. Not good for 6-feet tall people. 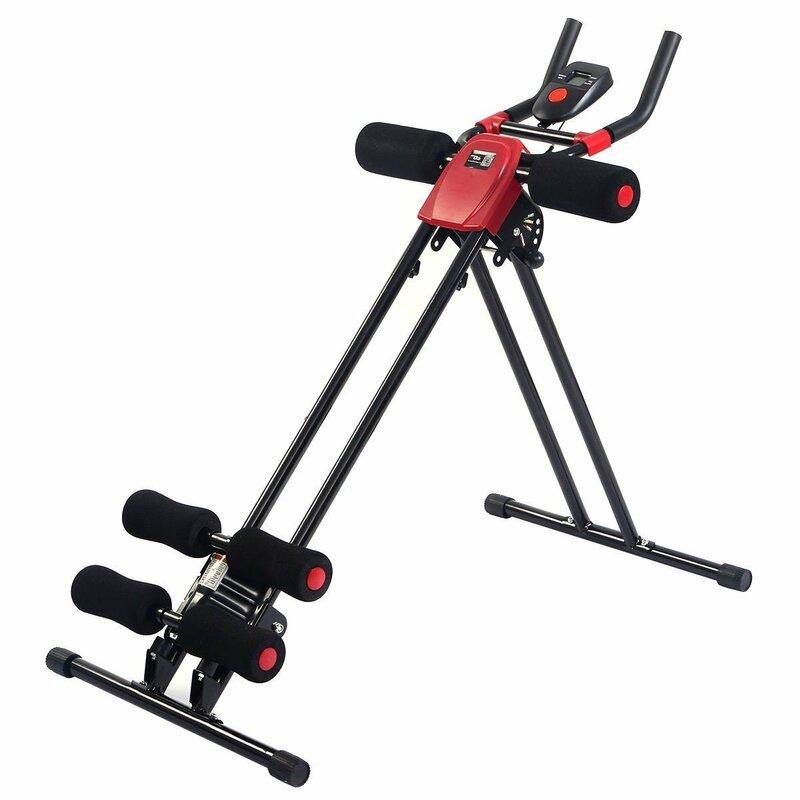 The Fitness Abdominal Trainer is designed to help you achieve proper reverse crunches to add in your arsenal. It’s also heavy-duty because the frame of this ab machine can easily support 250 lbs. There’s a cool gadget here that you might also like. You can track your time, calories burnt, and overall movement through a digital LCD fitness fast computer that comes with the machine. This gadget also gives you options to control and adjust your workout. You can indicate the amount of resistance or level of intensity that you want. Has four adjustment levels for workout variation. Digital computer can be easily read thanks the LED lights. Monitors your workout and helps you adjust to different kinds of resistance. Great ab machine if you’re reliant on reverse workouts. Handles are not perpendicular to the frame, can give you difficulty sometimes. Foam rollers are not comfortable to use. Material used is not rust-free. The Ab Coaster Max is a different take compared to the other products that we reviewed in this section. What makes this ab machine unique is its smooth bottom-up motion. The curved body is probably the first thing that you’ll spot in this machine. This arc creates constant core contraction when you use it. By this, it means that it targets all of the muscles that are a part of your core. The motion you create here creates consistency for even distribution of intensity. A unique product that is great at what it does. You only need one workout exercise through the bottom-up motion to see great results. It still has other options such as obliques and glides if you want more variation in your workout. Can easily support until 300 lbs. Freestyle seat targets all of your core muscles. Elbow pads may feel quite odd for shorter people. Nuts and bolts may rust over time. Not foldable and the arc feature gives it a bigger frame. There are many great ab machines out there that can assist you in getting the body and core that you want. When we’re giving out the verdict based on three things: durability, effectiveness, and comfort. With that said, the Body-Solid GCAB360 stands above the rest. There aren’t many cons in this product, mostly because you’ll only have trouble in assembling it. However, once you’ve gone through that, this ab machine offers the best package available. Its frame is extremely durable since it’s made from commercial grade steel. You get a variety of positions to try in your workout. Hence, you get to target more of your muscles. The Body-Solid is also easy to store and has comfortable components that keep you safe and secure. If you play to buy an ab machine, you are probably looking to kit out a garage or home gym. If this is the case, be sure to check out or post on How To Select the Best Power Rack – A Detailed Review. A power rack is an essential part of any home gym and the ones we reviewed will give you the best value for money.